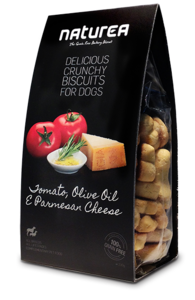 The dog biscuit that the owner can also eat. 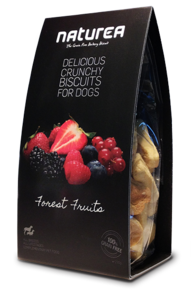 Naturea Dog Biscuits are 100% grain free and made with human grade ingredients, free from wheat, corn, soya and gluten with no preservatives and only natural antioxidants. 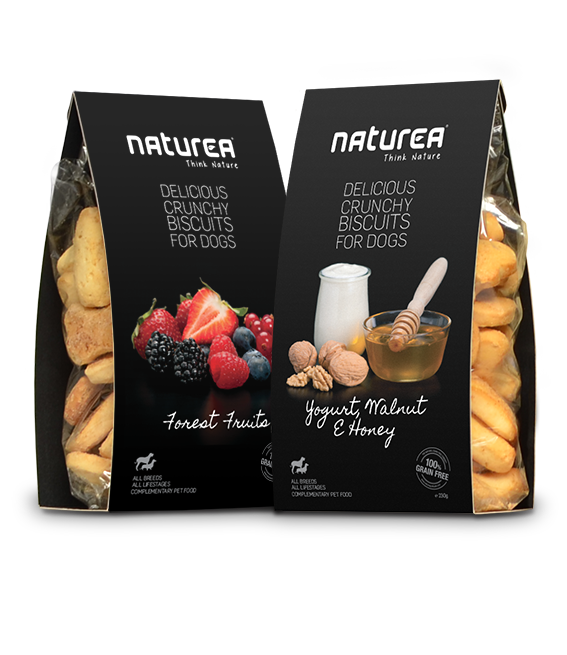 Developed by nutritionists and veterinarians, Naturea’s Grain Free products follow a Naturally Appropriate Concept which is similar to what a dog or cat would eat in the wild. 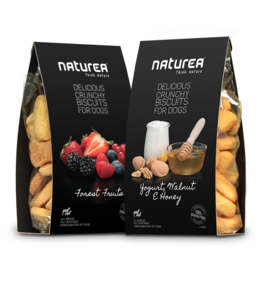 Produced to the highest standards with all ingredients approved for human consumption, Naturea diets help to prevent food allergies, excess weight and diabetes. 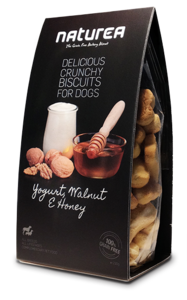 Naturea’s BAKERY BISCUITS are hand crafted in the typical tradition of a small Portuguese seaside town. 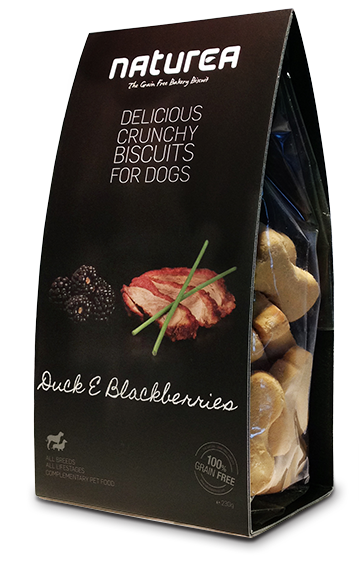 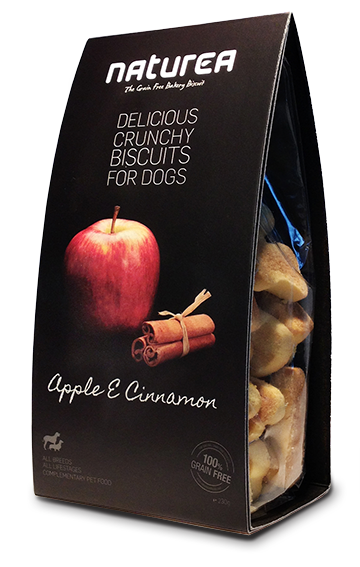 Home-made, lovingly baked and grain-free, these biscuits provide a unique flavour experience to your furry friend. 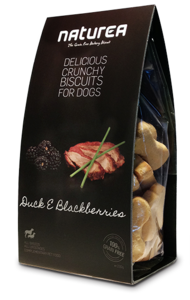 DUCK & BLACKBERRY – Potato starch, vegetable oil, whole eggs, honey, duck and blackberries. 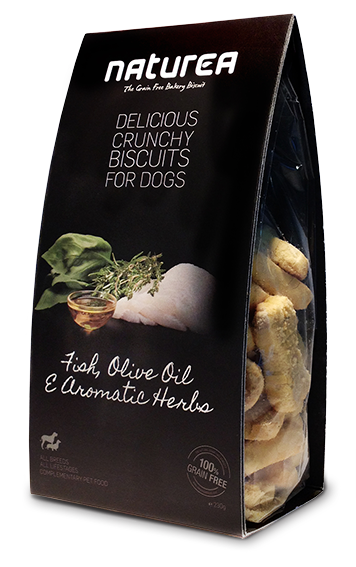 FISH, OLIVE OIL & AROMATIC HERBS – Potato starch, vegetable oil, whole eggs, honey, fish, olive oil and aromatic herbs. 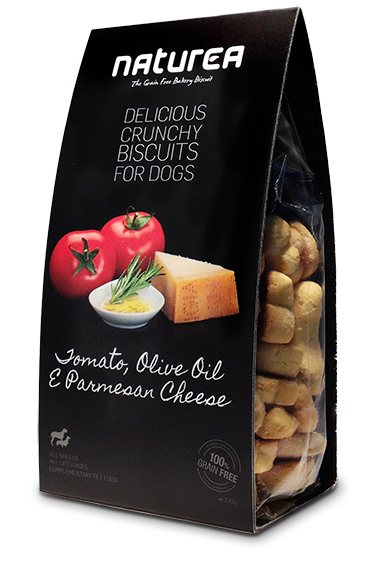 TOMATO, OLIVE OIL & PARMESAN CHEESE – Potato starch, vegetable oil, whole eggs, honey, tomato, parmesan cheese and olive oil. 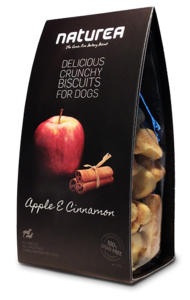 APPLE & CINNAMON – Potato starch, vegetable oil, whole eggs, honey, apple and cinnamon. 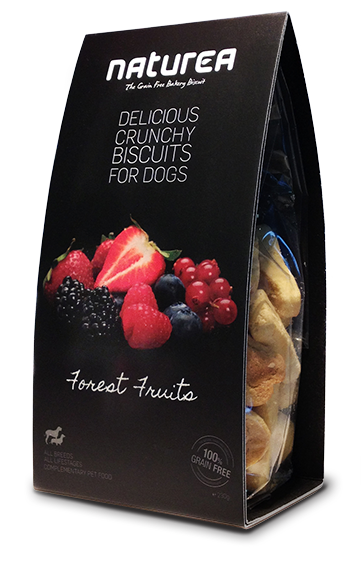 FOREST FRUITS – Potato starch, vegetable butter, whole eggs, honey and forest fruits. 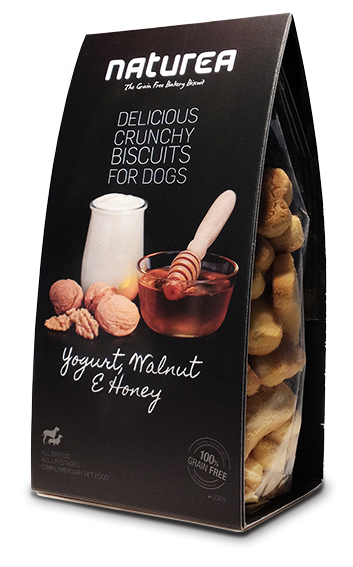 YOGURT, WALNUT & HONEY – Potato starch, vegetable oil, whole eggs, honey, yogurt and walnut and honey. 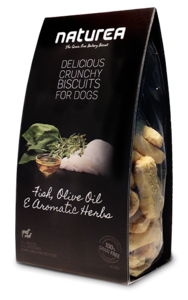 Analytical Constituents: Protein 10%, Oil 28%, Fibre 3%, Ash 1%, Omega 3 0,75%, Omega 6 2,5%.